Looking to buy a Fitbit at a low price? Cheap Fitbit sale prices can save you a lot of money at this time of year as the number one name in fitness trackers are a popular pick to keep you inspired to nail those New Year Resolution fitness goals (it's not too late!). The competition in the fitness tracker world is ever-growing, which is actually good news for lower Fitbit prices as the brand has to push hard to remain competitive in price. And with each fresh iteration of its fitness trackers or smart watches we see further improvements, showing that corners aren't being cut to keep prices down either. New versions usually mean cheaper Fitbit prices on older models too, so there's always a bargain to be had somewhere. 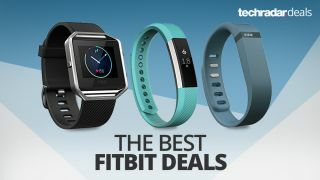 This guide to the best cheapest Fitbit deals takes a look at the models still readily available and compares prices at a wide range of retailers. So if the newer ones are looking a bit pricey for your needs, keep scrolling down, and we're sure we'll be able to find you something. The new best cheap Fitbit? The Fitbit Inspire looks set to eventually replace the Fitbit Alta as a fantastic entry-level fitness tracker that's not too light on features (yes, we're talking abut you, Fitbit Flex 2). The new Inspire is priced similarly to the Alta yet has a bigger screen. It's a proper touchscreen too, instead of the less user-friendly tapscreen on the Alta. There's a new button on the side to act as a 'Back' button in the menus, so navigation of the trackers features are much easier to cycle through. The Fitbit Inspire is better in the wet and can actually be worn while swimming too rather than just being splash and rain-resistant. The casing around the face is now plastic, rather than aluminium, but this makes for a more comfortable wear on the wrist and it's a touch lighter. All in all, while we're seeing the Inspire priced at a similar level to the older Alta, the Inspire is the clear winner. Like the Fitbit Inspire mentioned earlier, the Fitbit Inspire HR looks set to replace our previous budget-friendly option in the Alta HR. As the name suggests, the main difference between this and the other Inspire model is the inclusion of a heart-rate monitor. It's not a lot of extra money to spend on the feature in all honesty and can be useful in tracking your fitness levels. If that's a feature you could live without though, because you're very aware of your your heart-rate because you can hear it thundering between your ears when running up that hill, then you may as well save yourself some money. The screen on the HR is ever so slightly bigger if you're looking for the right nudge to opt for the upgrade though. The Fitbit Charge 3 is a marked improvement over the still-impressive Charge 2. The thinner design with softer angles on all sides make it a more comfortable wear. There's a proper touchscreen this time too rather than a tap-to-cycle one. The Charge 3 is waterproof up to 50m, meaning it's absolutely fine to wear while swimming and it has tracking features to use while you do. Add in a heart-rate tracker, multiple apps for loads of different sports and a seven-day charge time (two days longer than before) and the Fitbit Charge 3 prices start to look like excellent value for money. The prices below are for the standard version, if you want to see the special edition version with its woven or silicon straps and Fitbit pay functionality we've rounded up the prices for that one on this guide for every edition of the Fitbit Charge 3. Feature 'Lite' for the price? While the official MSRP/RRP of the new Fitbit Versa Lite is quite a bit less than the starting price of the more feature-rich original Fitbit Versa we've found that the later if often available for a very similar price to the Lite. In these situations is just makes much more sense to go for the full-fat version. However, prices will drop eventually and that's when you should consider the Lite if you don't need the full suite of features. We absolutely love the blue and magenta versions the Lite is available in too. As for features, you get connected GPS via your phone, water resistance up to 50m and a range of fitness apps. However, compared to the regular Versa, you don't get Wi-Fi, onscreen workouts, floor/swimming lap tracking or music storage. So take a look at the latest prices and compare them with the regular Versa if these are features you'd want. While its feature set isn’t quite on par with that of its bigger brother the Ionic, the Fitbit Versa feels like the same watch but with a lighter and friendlier design and a much lower price point. It brings a clear, bright and beautiful screen, a new and improved heart rate sensor that will apparently be updated with even smarter functionality via a firmware update, smart notifications, contactless payment capabilities, and all the features Fitbit users will have come to know and love. The Fitbit Alta is a fetching, form-fitting fitness tracker that looks more like a bracelet. But don't let its looks fool you too much. Underneath, it packs in the same Fitbit smarts, like step, exercise and sleep tracking functionalities. To top it off, the battery life is astoundingly good. The display, while quite small offers much more feedback than the LED lights of the cheaper Fitbit Flex 2. For us, this is the best cheap Fitbit option if you don't want to spend a lot on one. The Flex 2 is just too basic on its own. The Fitbit Alta HR takes the fetching formula of the original and adds heart rate monitoring into the mix. During use, we found it to be surprisingly accurate and the OLED display shows the metrics in a simple, easy-to-read fashion. Much of this package is also available on the Alta, like the usual Fitbit smarts, including step, exercise and sleep tracking functionalities. To top it off, the battery life is astoundingly good. Opt for this model if heart rate-based exercise is important to you. It's mostly the same as the original Alta, but the added functionality for not much extra cash down is a good thing in our book. Buy the cheaper Fitbit Alta instead? The Fitbit Ace is aimed at the kids' market, or more likely, fitness-conscious parents. Thankfully, Fitbit hasn't gone too far down the targeted design route and the Fitbit Ace actually looks very similar to the design of the Fitbit Alta rather than opting for zany colours or ugly armour casing. The Fitbit Ace fitness apps inside have been simplified a little though to make it much more child-friendly and there are star badges to 'gamify' exercise a bit more and give them incentives to be more active. There's a decent level of waterproofing too as the Ace will withstand splashes, rain and even showers - although it won't stand for being submerged in the bath or the swimming pool. The smaller wrist-strap can be a better fit for smaller children too. If your child is a bit older, tech-savvy or growing fast, it may be worth skipping the Fitbit Ace and looking at the regular Fitbit Alta as we find it's generally cheaper nowadays, although it's only water-resistant against mild splashes and rain. Fitbit Charge 2, another modern spin on a Fitbit classic, is packed with improvements and thoughtful tweaks over the original to make it worth your consideration. First off, the screen has been blown out to display even more information than before, including smartphone notifications – even if the feature is a bit limited. In addition, the Charge 2 features multi-sport tracking through the comprehensive Fitbit app that we know and love. This Fitbit isn't the cheapest model out there, but if it's multi-sport tracking data and on-screen information you seek, the Charge 2 will fit the bill. Better yet, with the Charge 3 out as well now, prices will start to fall on this version. If the Apple Watch and Android Wear (and now the Fitbit Ionic) smartwatches have caught your eye, but you don't want to sacrifice fitness know-how (or hundreds of dollars), the Fitbit Blaze may be the wearable for you. It boasts a vibrant display that showcases fitness metrics and a healthy share of smartphone notifications. This is one of the most versatile Fitbits that you can purchase at the moment. This model is splashproof, but not waterproof. But, the Fitbit Charge is much smarter than most and is one to consider if being connected is important to you. Connected GPS allows you to track run routes if you have your phone with you too. The Fitbit Ionic marked Fitbit's move deeper into smartwatch territory. It combines the best Fitbit goal-tracking software with all of the major features of a smartwatch, and it's a little cheaper than an Apple Watch. Plus, it works with both iOS and Android. The built-in GPS technology also means you don't have to take your smartphone out with you to track a route on a run either. You can also upload music to the device and pair it with some wireless headphones for tunes on the go. Another of Fitbit's wearables is an update to one of its oldest: the Fitbit Flex. The latest Fitbit Flex 2 doesn't do a whole lot to change the familiar look, but the innards have been refreshed to make this the one worth buying over the original. It's smaller, more fashionable, and most importantly, it's water-resistant, which was a first for Fitbit at the time. The lack of a screen might be a bother for some, but if you can adjust, this fitness tracker compensates by being remarkably low-profile. You don't even need to take it off before you hop in the shower. If a no-fuss tracker is on your list, this is your match. We'd give some serious though to spending a bit more and going for one of te alta models mentioned above though instead as the addition of a screen makes things much easier. If you're someone who works out a ton, you'll want to know about the Fitbit Surge. Competing against Garmin's high-end trackers, the Surge is Fitbit's most robust offering, packing in a long 7-day battery inside, along with a GPS sensor that can track your run or walk for up to 10 consecutive hours. It costs more than many other wearables in the Fitbit range, but it is generally better value than most smartwatches boasting similar specs. The inclusion of GPS, its splashproof design and a battery that can last up to 7 days makes it a smart option for workout enthusiasts.